Ray-Ray and I had the awesome privilege of visiting with Lisa Harper. Lisa wrote the foreward for my study on Elijah entitled, The Secret Source of Strength. We wanted to take her to lunch so we drove ourselves to Nashville and had us a big ole time at the Cheesecake Factory. Seriously. Give up? We tagged a trip to Disney's Animal Kingdom on to the CBA while we were in Orlando. I have always wanted to see this attraction. I am not overly fond of animated dinosuars or talking cars, so I am not a huge fan of Disneyworld. Of course, once those baby boys get up big enough, that will all change! But for now I do not want to spend the day with big-headed furry characters and animated animals. But real live animals-well, that is an attraction I can get excited about. We took the Animal Safari Ride. This is what we saw-up close and real! And we wandered through the ruins of Asia and saw wild tigers Lions, tigers, bears. Oh my! And we enjoyed the fellowship of dear friends! Craig and I leave Friday for a 17-day mission trip to Tanzania. We will be teaching Pioneer Evangelism with Wade and Barbara Akin and Paul and Elesa Redmond. Please pray for physcial strength and good health, mental clarity and good recall as we teach, emotional stability, and most of all-spiritual power. We need God to show up and be BIG in all we do. As for us-we go at His direction, we speak at His bidding, we minister in His name and we give Him all the glory. Great things He has done! In my absence, Ray-Ray is going to continue to post on the blog. She will post any updates if we are able to get to an internet cafe. If not, she will tell funny stories about the boxers, Sadie and Marleigh. Please post a comment and encourage her. She will be glad someone is out there reading her stuff! We had a wonderful time in Florida at the Christian Booksellers Convention. It was a tiring week but we met some great folks. Ray and I got to meet Vicki Courtney. She has a real heart for teens and helping parents navigate them through the tough adolescent years. I hate to admit it, but I gushed when I met her. Notice the fawning. It was almost stalker-like! We also got to meet Mark Driscol and get a book signed. He is a pastor and church planter in Seattle. We all fawned just a bit. I publish my Bible studies through CrossHouse, a subsidiary of Hannibal Books. Louis and his wife, Kay, are the owners. Here we are in front of the booth. Louis has just written a book, Witness to the Truth (see my sidebar). Spending a week surrounded by 100s of believers was a premature glimpse of heaven! Even so, come Lord Jesus! A mom who has boys will be surrounded by handsome men all her life. That is a quote that I read recently. I agree but did not know it would reach to the second and third generation! The Sweet Prince came for a visit to JJ's house. Seriously. Look at this face! I asked if I could sit with Grayson between feeding and breathe in all his baby goodness. He and I held each other for 4 solid hours. He did not cry one time. Yes, I am just that good! Here is our Prince Charming at 4 weeks...so very new to this world! Yum! This face owns my heart. Grayson Farris Stockdale at 3 weeks and 2 days. Don't you just love 'em? They are a very special group. They were the first moms group out of town that signed on to do Traveling Light. It was a faith walk for all of us. The moms group presented me with a love gift designed by one of the moms and made by her husband. It is entitled "Standing Near the Cross." It is a hand blown glass sculpture by Miguel Arribas. His wife (in the green) designed it and he made it! It has a mom and 2 boys, standing near the cross. Oh sistas, can you tell I am gearing up for the "ugly cry?" Oh my heart! This was a precious opportunity for Ray and I to fellowship with some sweet mommas and hear how God is using the ministry in Orlando. God is good. Thank you, dear bloggy friends, for praying for me as I am in Florida at the Christian Booksellers Convention. It has been overwhelming to say the least but we have managed to have a ball! Ray found us a condo to rent for the week which has allowed us to throughly enjoy our down time. We have been on a fast track. I will give you some of the highlights and later I will post some pictures from the event. Thousands of Christians are here as vendors or as buyers. It has been thrilling to be among such a large part of the body of Christ! We have met some neat people. I spoke on Friday to the Moms from FBCF and we had a great time with them. They presented me with a gift that I will tell you about later but is absolutely captured my heart and nearly sent me into the ugly cry! 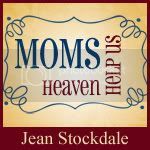 Several moms shared about what moms had meant to them-well, I was about over the edge! More on that later. On Sunday I met with our publisher-Hannibal Books-and the 6 other authors that would be in the booth. On Monday morning I spoke to moms at 7:30 am. Then I did 6 Momspirations throughout the day. At 7:30 pm I taught a moms group. Long day! Lots of words! On Tuesday I did 6 more Momspiraitons. On Wed. I did 2 more of them. Lots of speaking! I also met alot of wonderful Christian bookstore owners, vendors, authors, etc. It was a great opportunity to meet some precious people in the Lord and see some of the new trends in the Christian market. Ray was a huge help-as usual. Our menfolk have been great troopers and toted luggage, driven, hauled, encouraged, and run errands for us. Today we are going to rest up and hope to do some sightseeing. We will return on Saturday. Wonder what shape my house will be in. By the way, Dawson called us and our well went out! Seriously! What a ride this has proven to be! Joy is still in tact. Feet are sore. Spirit is soaring. Heart is encouraged. Head is spinning. Brain is dead. Words are ALL gone. I got nothing left to say-this has never happened to me before. Check in later and we will have some pictures up and more stories. Please pray that the Lord will use this week to broaden our reach for the cause of Christ. Blessings. Just a Kiss from Prince Charming! Today, while I was indulging my vanity and having my nails done, Prince Charming came by for a visit. I missed it and I am not happy about that. But Craig took pictures for me so I am happy about that. Ray was here working in the ministry office so she got to hold him and smell all his fine newborn smell. This is what he looks like at 14 days. As you know, I have been writing a Bible study on the book of Philippians. Paul writes, Conduct yourselves in a manner worth of the gospel of Christ(Phil. 1:27). As individual believers we are to have good conduct. As the corporate body of Christ we are to be blameless and innocent children of God above reproach in the midst of a crooked and perverse generation among whom you appear as lights in the world, holding fast the word of life (Phil. 2:15). When you world falls in, literally falls in-when your ceiling falls in on your head-conduct yourself like Christ. Have this mind in yourselves which was also in Christ Jesus (Phil. 2:5). When the Flood of 2008 hit last night, Craig and I scrambled to grab stuff, dry it off, and move it out of harm's way. I assumed the actual hot water tank was on its way down! Anyways, I had 3 antique books on my mantle in the bedroom. One was red and one was green. Dye was already leeching out of the covers when I ran to the kitchen with them. We documented every detail with pictures, not knowing what the insurance company might need. I wanted them to believe this really happened, since even I am getting skeptic about all that has gone bad in a short time! Anyways, I took a shot of my old books and raced back to the bedroom to salvage more of my "wood, hay, and stubble." This morning I looked through my pictures, and a glaring reality became very clear to me. We got to see Prince Charming yesterday. I have my heart in my hands. The CDs and DVDs for the Elijah study have arrived. If you pre-ordered a set, they were mailed out last Wed. It takes 7-10 days to go Media Rate. If you have not received your set after 12 days or so, please contact the office at jean@standingnearthecross.comand let us know. The Elijah Bible study workbooks are set to be shipped in the next few weeks. They can be purchased on-line at www.jeanstockdale.comand our ecommerce page is up and running. It will accept credit card purchases. If you know of any churches or small groups that might be interested in beginning a Moms Ministry, please direct them to our site. We are beginning to take orders for the fall semester. Craig and I are traveling with our favorite little bond-servants, Roy and Renae Terrell, to the International Christian Retail Show (formerly known as Christian Bookseller Convention) in Orlando, Fla. July 12 for a week. It is very unusual for a self-published author to get to have a booth. Thanks to Hannibal Publishers and CrossHouse I will be able to go and present our books and our ministry. I will be speaking to a Moms group from First Baptist Central Florida on Sat. night. They were one of the first churches to step out on faith and use my material, so they especially dear to me. 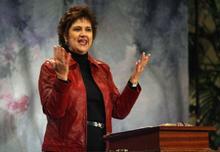 Cindy Estes, a former Bellevue member, is director of their WM. The pastor is Clayton Cloer. When he was in Memphis at Seminary, his sweet wife Linda attended Moms. Through the ministry of the Word she discovered she was not truly saved and gave her heart to Christ! So, I know you can understand why I am so excited about getting to be with this sweet group of Moms in Florida. The Convention begins on Monday. I am scheduled to speak at several 10 minute Momspirations throughout the day. I am speaking Monday night to a program open all local churches. Tuesday, Wed., and Thurs. will be more of the same. It is such a God thing that we were invited to go and such a great opportunity to impact more mommies for the kingdom. Please pray for me. It will be a very busy and tiring week. I need physical strength, discernment, and spiritual power. If any of you know of any mommas in Orlando that might want to come, please pass the word along. If you are interested in reading about it click on International Christian Retail Show. Check in with me tomorrow. I will post pictures of our water leak disaster and tell you how not to lose your joy! I am having Joy in the Journey with Jesus. Yes ma'm, I am! On June 20th, the Sweet Prince turned one year old. Seriously, how did that happen so fast? Jason and Patti held the party at our house because we have a big yard. Patti chose a monkey theme for the birthday, and don't you know-that girl can work a theme. We had monkeys everywhere! It was adorable. Here is a picture of our monkey snacks. Here is a picture of our little monkey's cake. And here is a picture of our little monkey! And this is where we put all the little monkeys! Because I have been so mushy about our new Prince Charming Grayson, I have overlooked several things I had meant to share with my bloggy readers. Bro. Steve and Donna Gaines recently had a wedding in their family. Their oldest daughter, Lindsey and Ryan Wingo were recently married. Craig and I were privileged to be invited to participate in a Blessing Dinner for the couple. The event was several weeks ago. I had never been to a Blessing Dinner. Maybe you have, but I thought I would share with you how ours went. The hosts gave the couple of large picnic basket filled with every important items for a love that lasts a lifetime. It included a Bible, a book on love and respect in marriage, their engagement picture (to always remember this special time in their lives), a clock (a reminder to never let too much time pass after an argument), a mink throw (for an indoor picnic) and a cheerful platter (to remember to laugh often and loud). Each item was presented and a word of encouragement or instruction was given. Each host couple gave a word of blessing. The evening concluded with the women praying over Lindsey and the men praying over Ryan. Although I know this evening was not all about me, I sure did have fun. I think the special guests did too! Judge for yourselves.